Summary: Learn how to repair and patch plaster, patch small holes in plaster, patch large holes in plaster and repair a corner using plaster. Repairing an area of damaged plaster is called patching. 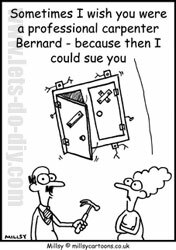 The size of the damaged area will determine the method of repair you use. If the hole is smaller than 50mm (2 in) wide, fill the crack with a single layer of patching compound slightly shallower than the surface of the surrounding wall. Once dry, apply finishing plaster. 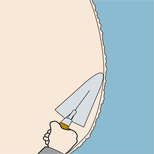 Apply the plaster in strokes with a trowel going in both directions across the hole. Larger areas of damage can be patched using a one-coat plaster. Always mix the plaster according to the manufacturer's instructions, but generally 1kg of powder is mixed with 500ml of water. As a rough guide, 10kg should cover about 1.5 sq m (1.8 sq yards) at a thickness of 10mm (4in). Use a cold chisel and a lump hammer to chip away the crumbling plaster until the surface is firm all round. Brush away dust and debris from the damaged area. If the brickwork or blockwork has been exposed splash water over the area. Having mixed the plaster, fill in the damaged area with a plastering trowel or filling knife held at a slight angle. Build up the level gradually, letting each layer stiffen slightly but not dry, before applying the next layer. If the wall is to be decorated with wallpaper apply the ready-mix plaster until it is level with the original plaster surrounding the damaged area. After the plaster has completely dried out, use a power sander or a fine abrasive paper to smooth the area. Wear protective goggles and a facemask when carrying out this task. If the wall is to be painted, leave a 3mm recess from the top of the surrounding surface area to apply a coat of finishing plaster to produce an even smoother finish. When the undercoat is tacky, use a nail or sharp edge to score the plaster to make a key for the finishing coat. When the undercoat has set mix the finishing coat in a bucket until you have a creamy consistency similar to melting ice cream. Apply the finishing coat with a trowel, tying in the edges to the surrounding wall surface. Fill in the damaged area using a plastering trowel gradually building up the layers. 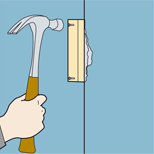 To repair a damaged corner, knock away the crumbling and loose plaster with a cold chisel and lump hammer. Then brush away any dust and debris. Temporarily fix a batten vertically to the wall on one side of the damaged area to give you a straight edge. A spirit level can be used to check the edge of the batten is flush with the surface of the undamaged wall. Position the nails as far away from the corner as possible to avoid causing more damage to the plaster. 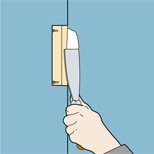 Leave the nail heads protruding to make it easier to remove the batten when the plaster has set. Fill the damaged area with plaster using a plastering trowel. Make sure the plaster is flush with the edge of the batten and ties in with the existing plaster. When it has set, move the batten to the adjacent wall and repeat the process to produce a sharp angle. If you need to apply a finishing coat, repeat the process of fixing the batten to both sides of the corner. To finish the corner use a corner trowel to take away the sharp edge. If a corner is being repeatedly damaged, it will need reinforcing with metal angle bead. Cut the anglebead with tinsnips or a hacksaw to the required length. Fix the anglebead to the corner with dabs of plaster 600mm (2ft) apart on both sides of the corner. 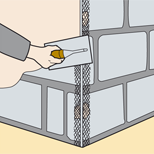 Use a straight edge and a spirit level to check the anglebead is vertical and that the corner will not protrude above the surface of the plaster. Apply the plaster with a plastering trowel, tying it in to the edge of the existing plaster and to the edge of the anglebead. Temporarily fix a batten vertically to the wall on one side of the damaged area. Fill the damaged area with plaster making sure it is flush with the edge of the batten. After fixing the anglebead in place, apply plaster to the area with a trowel and tie it in to the edge of the existing plaster.